This unique cookbook and rough guide to ethical eating is for all those who want to eat well, pay less and save the planet! Created by young people, with over 70 mouth-watering recipes - recipes that won't cost the earth. Read this book if you want to care about what you eat - and where it comes from. Laurane Marchive came to independent publisher Aurora Metro on a student placement from her University in France. 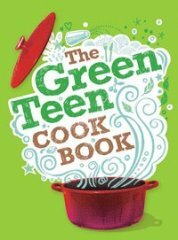 She was immediately roped into organising the Green Teen Cookbook and has spent the last 6 months cooking and testing all the recipes that were submitted by the dozens of young people for the project. She has studied Political Science and French Literature and has worked as a journalist and translator. A fun way to learn about cooking and how to become ethically aware when choosing ingredients. I have just tried the 'Sushi for dummies' - it's great! No more sandwiches... at last some recipes that I can actually cook - hurraye! !